First of all, you're probably wondering what the heck a Motty AFR Tuner is. Explore www.afrtuner.com for the full explanation. You can even get the user manual from the downloads page, which contains some great detail on what it does, how it does it and how you can customize its behavior. The short answer is that it's kinda like a Power Commander, except that it can continuously remap itself to achieve the desired air/fuel ratios. A Power Commander uses a lookup table of fuel injection adjustment values for combinations of throttle position and engine RPM. It intercepts the fuel injection signal from the ECU, looks up the adjustment value based on the current throttle position and RPMs, then adjusts the signal by the desired amount. Since the "map" on a Power Commander contains adjustment values that are to be applied to stock fuel injection signals, it's not something that you can just mess around with safely. To get a good map, you have to get your bike tuned on a Dyno. Unfortunately, the resulting map will only be 100% in tune for the exact conditions under which your bike was tuned. If you alter anything in the air intake, exhaust or the engine itself, you'll need to get a new map tuned for your bike. Even more subtle changes such as your air filter getting dirty or changes in temperature and humidity can cause the map to be out of tune. The Motty uses a fuel injection map at its core like a Power Commander, but it also has a corresponding target air/fuel ratio (AFR) map. It uses a wideband O2 sensor in the exhaust to measure the actual AFR, then adjusts its injection map to get closer to the target AFR. Air/fuel ratio is a much more meaningful value than fuel injection adjustment values. AFR values for specific goals (max power, max fuel economy, etc) are well discussed (google it), so you can safely make your own adjustments to the AFR map and let the Motty take care of the rest. With the Motty, your bike is continuously being re-tuned to stay 100% in tune with the desired AFRs. It can handle changes in weather, exhaust, intake, etc. The Motty also has a built-in data logger, which is most useful for pinpointing the parts of the map that are in use for your common cruising speeds. You can then adjust those portions of the AFR map to use AFR values for better fuel economy. The Motty AFR Tuner (~$600 when I bought mine; fluctuates with exchange rates). A computer (preferably a laptop) for configuring the AFR Tuner. If your computer does not have a serial port, then you'll need a USB to serial adapter. A Bosch wideband O2 sensor. Here's a good price on one. 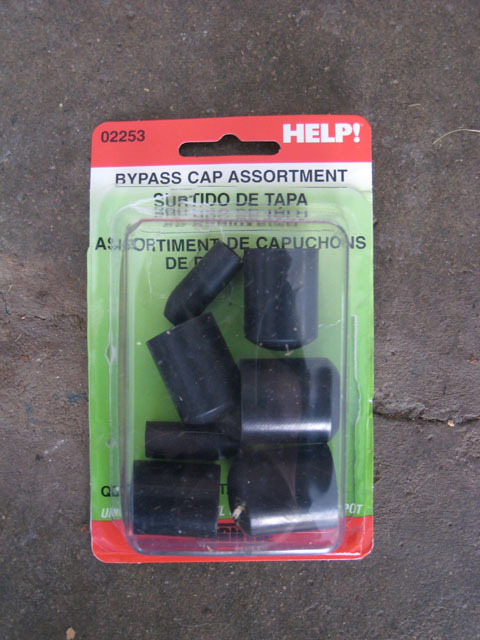 Wire cutters/strippers, exacto knife or razor blade, soldering iron, solder, shrink tube and/or electrical tape. A Dremel for trimming the tool tray. Basic tools for removing stuff from the bike. Service manual recommended to aid in removal/installation of panels, etc. Read the Motty AFR Tuner Manual thoroughly. There's good info in there. 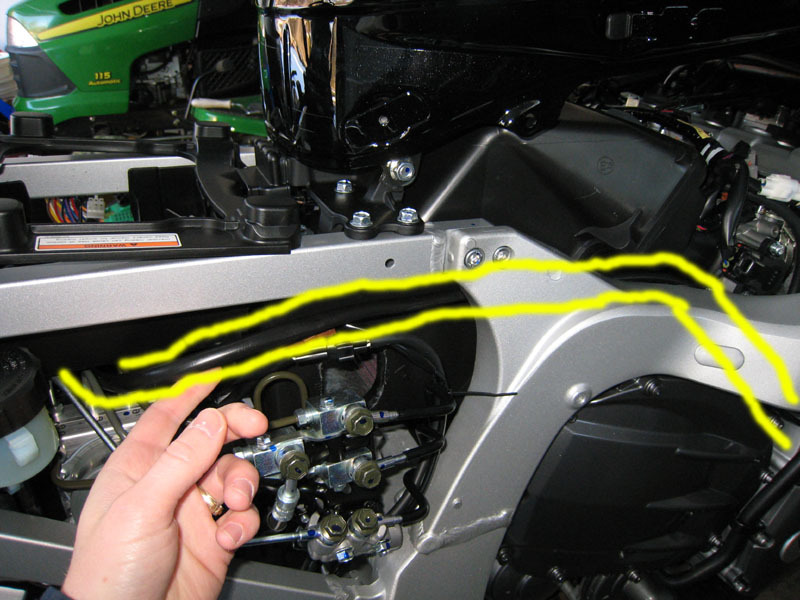 Note that my installation was on a 2008 FJR A. I know that a Motty has been successfully installed on a non-ABS Gen I FJR (2005 and prior years). 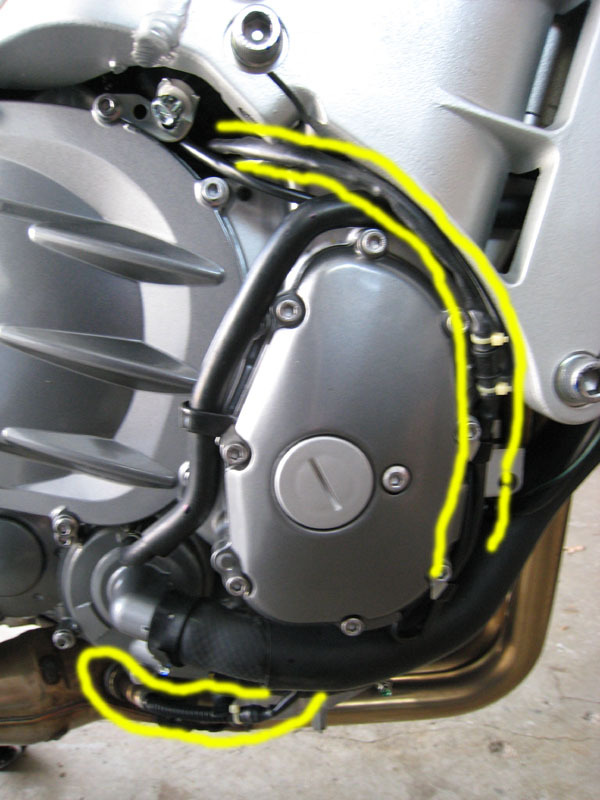 It was originally believed that the Motty could not be installed on any FJR with ABS due to the lack of VSS (speed signal) input to the ECU. I took the risk and verified that the wire that is in the same place as the VSS wire from the non-ABS Gen I bikes does indeed carry the same speed signal on the Gen II bikes, even though the wire is now coming from the ABS controller (speed signal is probably generated by the ABS controller from the signals of the ABS sensors on the wheels). The tips/instructions here should be valid for all 2006-2009 FJRs and they still may be helpful for 2005 and prior FJRs. A good first step is to remove the air injection system from the engine. 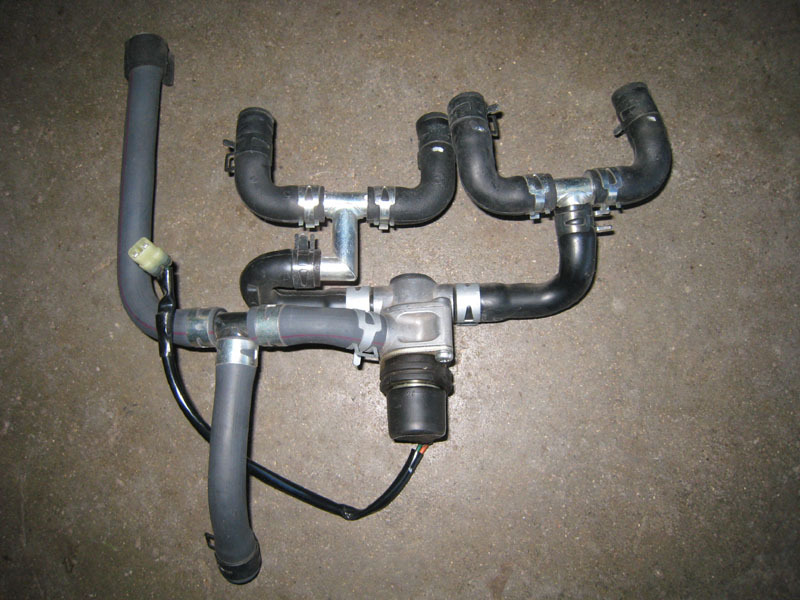 This system allows fresh air to enter the exhaust in some situations to allow unburned fuel to burn. 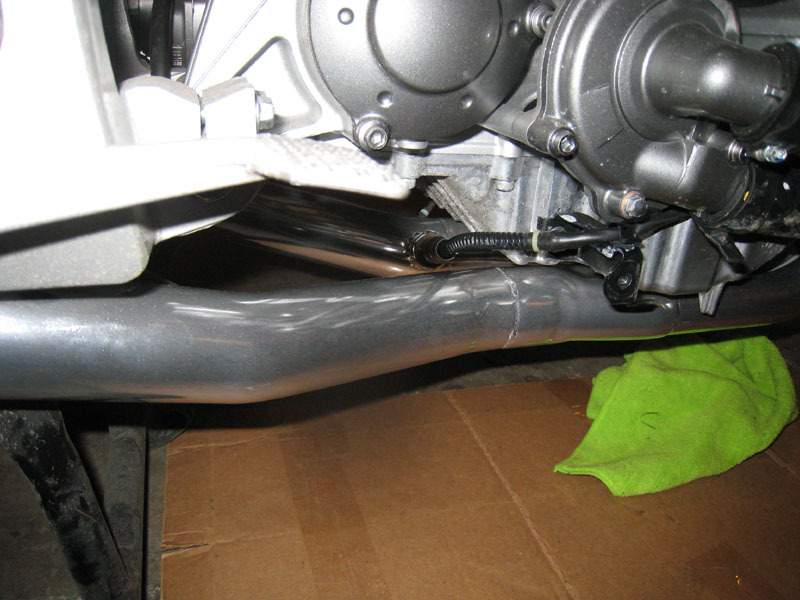 This introduction of fresh air in the exhaust will give false readings to the O2 sensor, which will cause the Motty to tune your bike incorrectly. This is also the source of deceleration popping with aftermarket exhaust. If you want to remove the metal wire that holds the reed valve solenoid thingy in place, be aware that the screw is very tight and easily damaged. I used an impact driver to loosen the screw. !!! UPDATE - WARNING - PAY ATTENTION !!! You'll want to remove the tool tray from under the seat so that you can trim a few areas so the AFR Tuner will sit nicely. 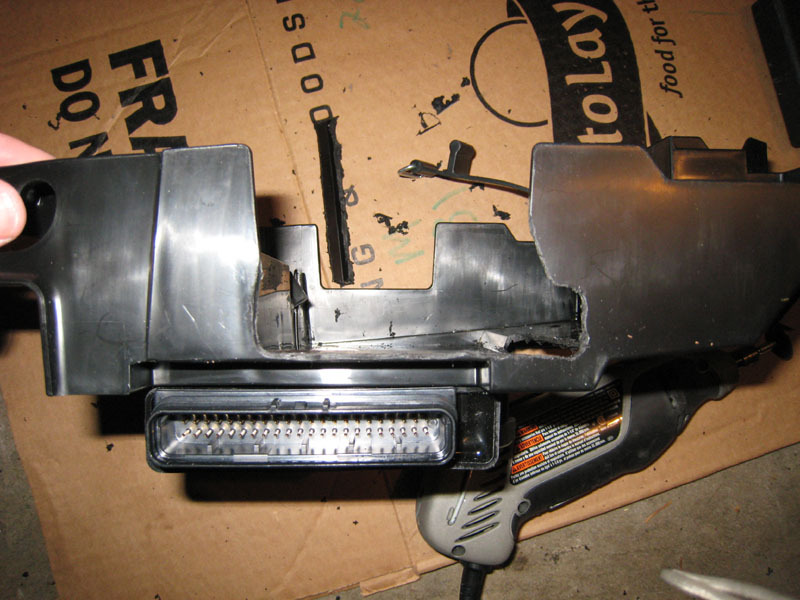 I don't know if it is possible to remove the tray without removing the gas tank hinge bracket. Just take the extra time to remove it and life will be easy. 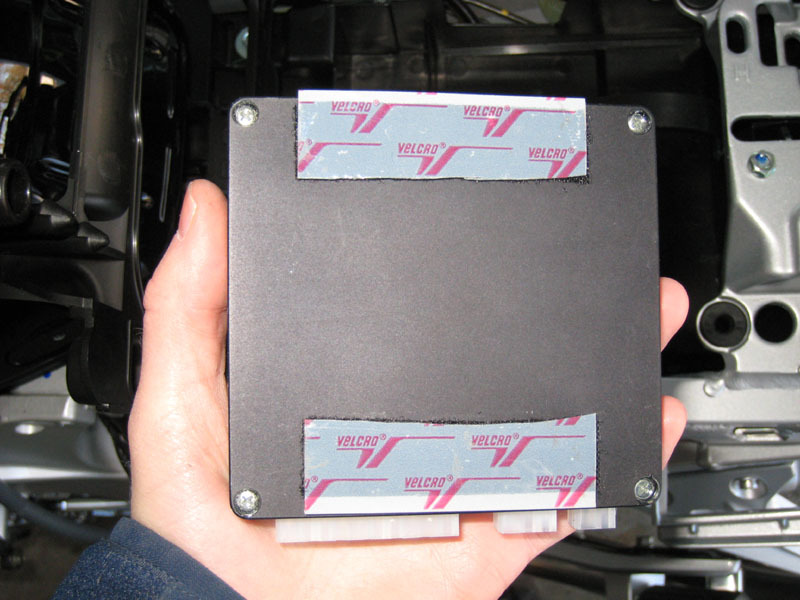 Remember that the ECU is mounted to the bottom of the tray, so you'll have to unplug the harness before removing the tray. 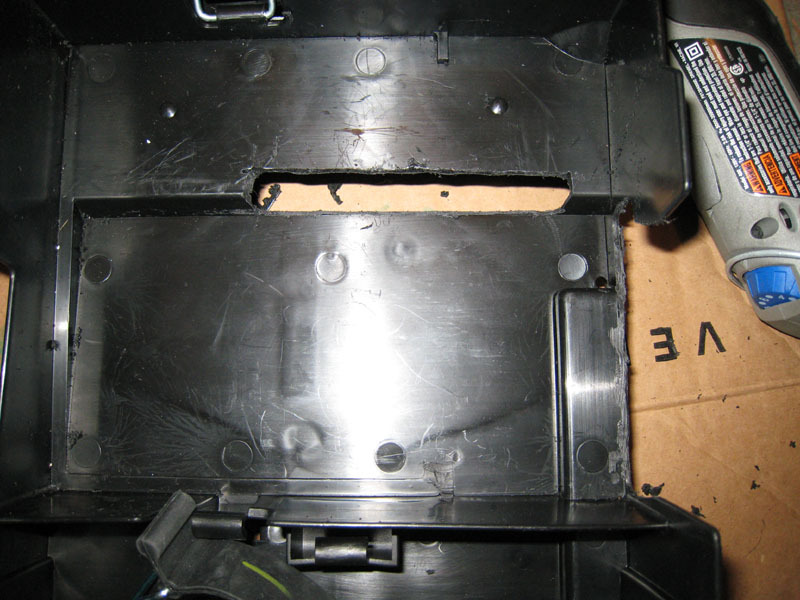 Unplugging the ECU harness will require that you remove the left side panel and the black plastic cover that is behind that panel. While you're at it, you might as well remove the right side panel. You'll need it removed later anyway. Reinstall the tray on the bike and velcro the AFR Tuner in place. It's time to wire it up. 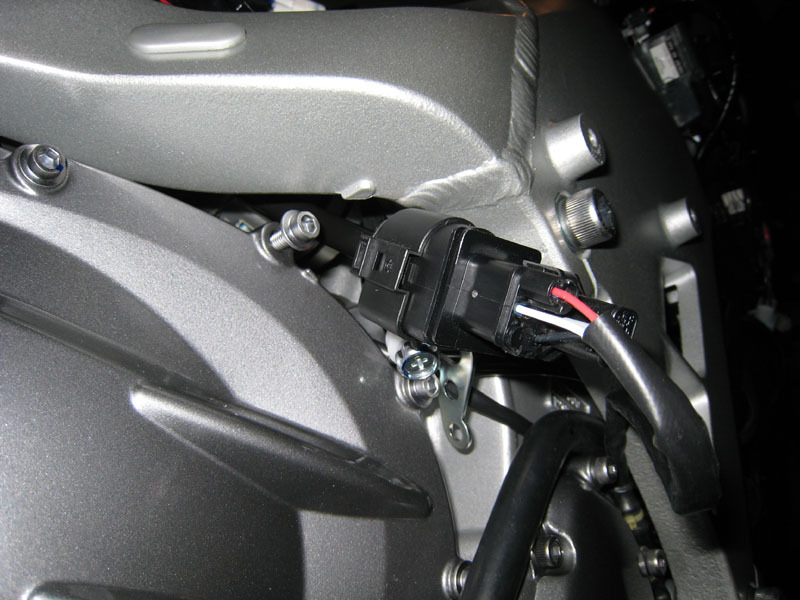 The manual includes wiring tables for various bikes, including the FJR, that tell you exactly which wire from the AFR Tuner needs to be spliced into which wire from the ECU harness. Just take your time and double check before cutting and/or stripping any wires. 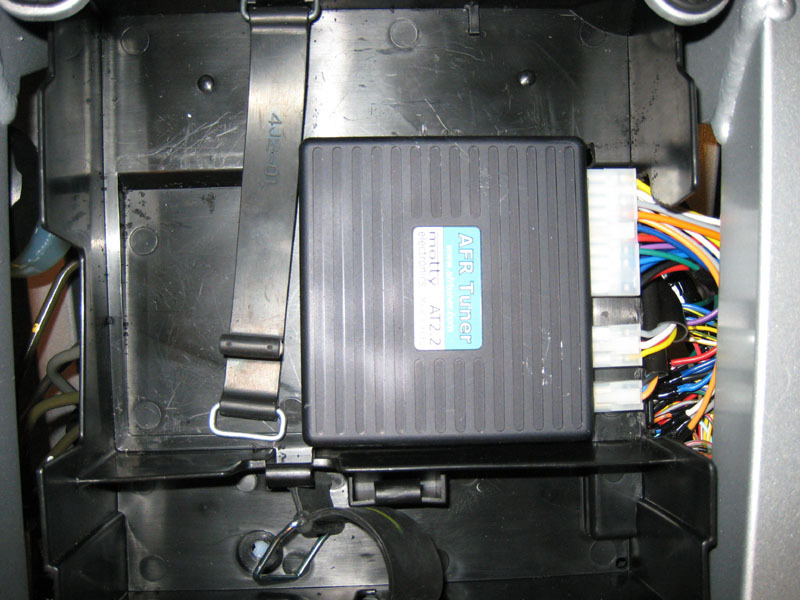 The wiring harness supplied with the AFR Tuner has very long wires with a protective sleeve. Since the mounting location is so close to the ECU, I did away with the protective sleeve and cut each wire to length as I connected it. There's 3 white bars on one side of the ECU harness. Pushing them all in will releas the pins so that the wires can be removed. More details on that can be found in a Barbarian Mod article. 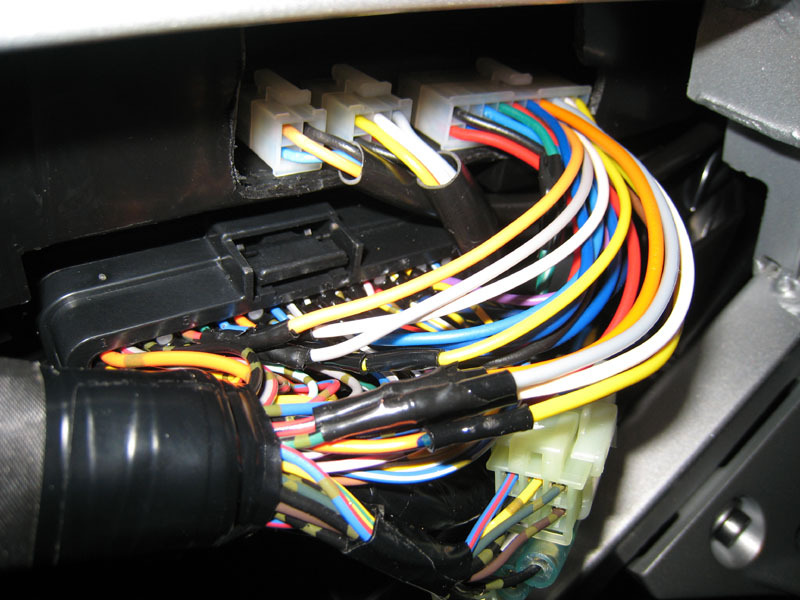 Remove only one wire at a time from the ECU harness so you are sure to put it back in the right place. You won't be stripping the ends of the ECU harness wires, but a section away from the end. My technique was to use wire strippers to just cut the insulation at the beginning and end of the section that I wanted to strip. I then used an exacto knife to carefully shave the insulation down to the wire on one side along the entire section. Then I could just peel the rest off. Be sure to splice into the ECU wires far enough away from the pins so that the pins can be fully inserted back into the harness. These connections are very important, so solder them. Don't try to get lazy and use those plastic snap-on splicers. These connections are very important, so use shrink tube to insulate them. Mine's a little sloppy due to some shrink tube mistakes that required additional shrink tube and/or electrical table to fully insulate the soldered connections. When the wiring is complete, you can follow the manuals instructions for testing. It involves first plugging an adapter into the wiring harness that should result in stock wiring pathways and making sure the bike runs normally. Then there's several things you can check with a multimeter. Before worrying about installing the O2 sensor, you might as well hook the AFR Tuner up to your computer (with bike ignition on, kill switch in kill position) and go through the various calibrations as specified in the manual. The O2 sensor must be calibrated while it is out in the open, so no sense installing it yet. You'll have to remove 2 bolts that are holding wire guides along the side of the engine. just follow the wire up to find the connector for the stock sensor. The wire should be disconnected before removing the sensor so you don't twist and damage the wiring. 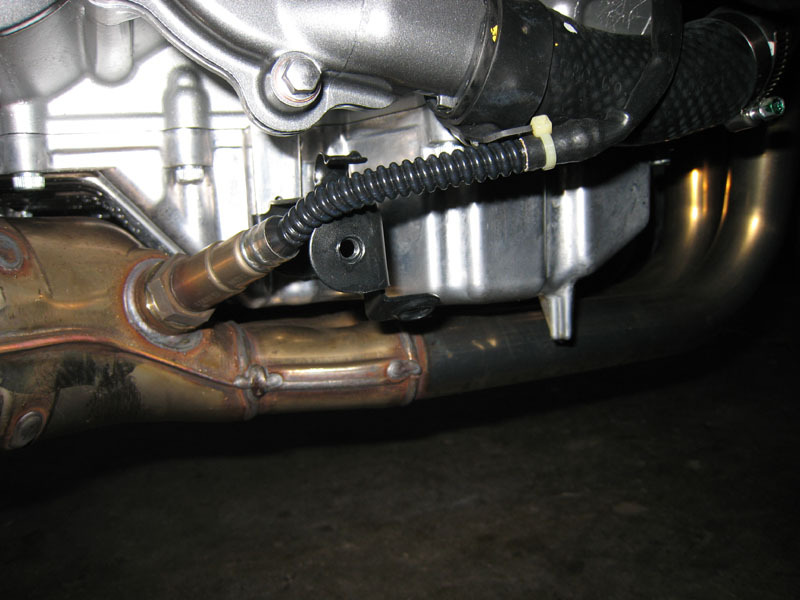 If you have Holeshot headers, then you need to get an O2 sensor bung welded to it. I placed mine here, and it doesn't affect how the O2 sensor cable is routed. Note that with an O2 sensor here, the Motty will be tuning all 4 cylinders based on the average AFR of only 2 cylinders, rather than an average AFR of all 4 cylinders with the stock header. This is not expected to be a problem. Note: The new O2 sensor connects to the AFR Tuner only. Just tuck the empty connector for the stock O2 sensor somewhere. The bike will operate just fine with no error codes. That wasn't so bad, was it? Just put your bike back together, double check the configuration and calibrations of the AFR Tuner, then go for a ride. Be sure to read the manual and fully understand how to operate the AFR tuner. For example, data logging is off by default. When you turn the ignition on, but before starting the engine, you can hold the throttle open 100% for about 1 second to turn data logging on. It's also important to understand under what conditions self-mapping will actually happen (restricted by engine temp, throttle/gear combination, etc; all configurable). You also have to shut the bike down in a specific manner if you want to save the self-mapping adjustments from the ride (use kill switch, then wait a few seconds before turning ignition off). Understand how it works, or else you could find yourself frustrated and believing that it's not working as advertised. Stay tuned for a separate post in the future about how to use the data logger as a guide to adjust the AFR table for cruising fuel economy. I won't post that until I have some experience doing it myself, which could be a while due to the cold and snow here. Great write up. How long did it take you? Did you buy it directly from Motty? It's hard for me to gauge how long it took me because I spent quite a bit of time trying to find some place to mount the unit that did not take up any storage space. I could not find such a place where it would be protected from the elements, so i finally gave up some storage space. I minimized the loss of storage space by trimming the tray so there wouldn't be any wasted empty gaps with the Motty installed. If you are comfortable with removing parts from the bike and have some basic soldering skills, then I would guess that it would take about 4 hours. Buying directly from Motty is the only way I am aware that you can get one. Don't let the whole foreign country and exchange rate thing scare you. If I remember correctly, PayPal handled the currency conversion for me and the Motty arrived within 3 business days. I already know that it does what it's supposed to. When I started it up the first time (idling in the garage), it started off running with a measured AFR in the 14.X:1 range. After the engine warmed up into the temperature range in which self-mapping is enabled, the measured AFR made its way down to the target of 13:1 within about 20 seconds. It was pretty cool to watch it in action on the laptop. Once I get to ride the bike, the first thing I'll be fine tuning is the engine temperature range in which self-mapping is allowed. I'll need to adjust it to match the "normal" operating range of the bike after it's been warmed up (the data logger will help me discover that range). I'll post a separate topic about fine tuning the settings after I've gone through it. I can't wait to get my Holeshot headers and Remus Hexacones installed. I'll be at peace knowing that the Motty will automatically adjust itself for the new mods . That's another great benefit of the self-mapping. You can install the Motty and enjoy it, then make incremental changes to the bike as you have time and money. With a Power Commander, it's best to do all of your mods at once so you can get the Power Commander tuned only once for the final result of your mods. Where do you plan to put the O2 sensor (or sensors) with the headers? I think MOTY has an option for 4 channel A/F input. Dyno Jet is coming out with a PC-V with 4 channel input and adjustibility, but I don"t think it is available yet. Terry Components has a system with continuous wide band adjustment that is plug & play (I think) but uses one sensor only, and I have heard some comments about it's reliability. I just got through carving up my air box and am wondering about relative cylinder values as a result. Sweet product, it's nice to see a tuner that can actually works well with a closed loop system. The alternative solution of disconnecting the O2 sensor and throwing maps at it (in my opinion) is just a step in the wrong direction. With this product you can truly set it and forget it. I'm having a bung welded onto one of the Holeshot headers right after the 2-into-1 collector, and also getting them ceramic coated. I'll post pictures when I get them back in a couple weeks. With this setup, all 4 cylinders will be tuned the same based on the average of 2 cylinders. I'm not racing in competitions with this bike, so it should be good enough. I would sure hope that the 4 cyclinders don't vary enough to cause problems with everyday and occasional spirited riding. Yes, the Motty does have upcoming modules for 2- and 4-cylinder individual mapping. I'm pretty sure that the basic setup with only one O2 sensor should be good enough for my needs. But who knows - maybe I'll get the itch for absolute perfection and go for the 4-cylinder mapping with 4 O2 sensors. I ordered my Motty about 2 weeks before the new Power Commander info was released. I'm still happy with my choice because I get the mapping, self-tuning and data logging all together in one package. You'd have to buy the new Power Commander and 2 additional modules to get similar capabilities. I'd be willing to bet that it would cost at least $200 more than the Motty, plus you have more wiring harnesses to connect the modules together. The new Power Commander does have some nice features, such as per-gear mapping (likely to only make a noticeable difference if you have RAM air, because higher gears would have more air and require more fuel), and the ability to dynamically adjust fueling based on an input signal (such as boost levels). Then there's the quick-shifter and ignition timing modules that aren't even compatible with the FJR. The new Power Commander is also only officially supporting 2009 bikes and later. It would probably work on all 2006 and later FJRs, but you won't get any support from Dynojet. On the other hand, the Motty comes with great personal support via email with the creator of the device himself. He'll give you honest answers rather than canned "that's not officially supported so I won't even give you a hint about how you might be able to do it" that you often get from large companies. The Terry Components tuner is for Harleys only, as far as I know. I also think it's not adjustable. Just plug it in and hope you like the settings that were chosen for you by the manufacturer. I just carved up my air box this week too. I chopped off that funnel that blocks half of the air filter and opened up the right side of the air box. I like the extra growl when you whack the throttle open . It seems that if you sync the throttle bodies closely after the mod, each cylinder should be getting very close to the same amount of air, and therefore require very close to the same amount of fuel as each other. I guess that depends on what "user friendly" means to you. There's no walkthroughs where you answer questions and it configures everything for you, and no paper clip that pops up in the corner and says, "It looks like you're trying to improve throttle smoothness at parking lot speeds..."
The software is pretty simple. Just a few different tabs with different configuration and calibration settings, as well as a map editor and a status tab that displays the current status and input values of the device. It has some basic niceties like detecting if you're trying to upload settings to the Motty that were not made based on the current settings that are stored in the device and asking you if you're sure you want to do that (most likely, the answer is always "NO!" because you'll wipe out settings that you didn't intend to). You can download the software here and check it out for yourself. I also suggest downloading and reading the manual. The user friendliness is more based on whether you understand why to choose to change certain settings and really has nothing to do with the user friendliness of the software itself. If you would enjoy learning more about the relationship between throttle position, engine speed, road speed, etc. when riding your bike (data logger will help with that) and would enjoy applying that gained knowledge by tinkering with settings to alter the way that your bike is tuned to improve the bike for your personal style of riding, then you'll really like the Motty. If you don't want to tinker and would rather just plug something into your bike to make it better, then the Motty will probably do a decent job at that with the default settings (although there are some calibrations that are 100% necessary such as a speed scaling factor and gear ratio info), but you'll probably be disappointed. The Motty is not pre-configured for each make/model of bike, so you won't get the most out of it unless you tinker with settings. Once I settle on settings for mine, I'll share them along with the reasoning and methods I used to come up with the settings. My settings will probably be a better starting point for FJRs than the default settings, so that'll put you a step closer to "install and forget about it". Maybe the Mottty AFR is not for me. I'm actually planning on eventuality installing a pair of two brother's and would like to dyno tune the bike to its maximum potential without losing reliability. I'm not really interested in tinkering so much. I am simply looking for the ability to adjust for maximum HP and Torque while using an O2 sensor. My understanding is most other tuners on the market require you to disconnect the O2 sensor. Please correct me if I am wrong, with a closed loop system if you set fuel air mixture, throttle, position etc on a dyno for maximum HP- that threshold for maximum HP setting will stay constant even if there is change in elevation, barometric pressure, temperature and so on. By disconnecting the O2 sensor you are relying solely on a map that will almost never be ideal for real conditions. I would not even know were to start without the aid of a dyno and a professional tuner. I'm certainly not an expert in this area maybe you can suggest another product to fit my situation?? If you think the Motty AFR is a good fit, then I look forward to your findings. I guess my concern is the stock map that any tuner is adjusting from may vary from cylinder to cylinder due to the original air box design. Carving the airbox will upset that relative starting point for the tuner? Will try and do some research on that. Terry does make tuners for metric applications and I rode a vStar 1300 with one installed and was impressed with the change it made. It is non adjustable, but self adjusts to preset A/F ratios. A prior post revealed some reliability questions though. That would be great fun to see ...just let me know when you want to come over, you can bunk at my place. Great write up UP, I love seeing how people modify for power. I'll be following this thread. Disclaimer: Everything below is my current understanding of how things work. I'm not an expert. Hopefully we have an expert that can tell us how close I am to being right (or completely wrong). As far as I know, the varying CO settings are for equalizing the 4 cylinders to make up for manufacturing tolerances in the injectors. If the design of the air box creates an imbalance between the throttle bodies, then syncing the throttle bodies would restore balance by restricting airflow to cylinders that get more air due to the airbox design. 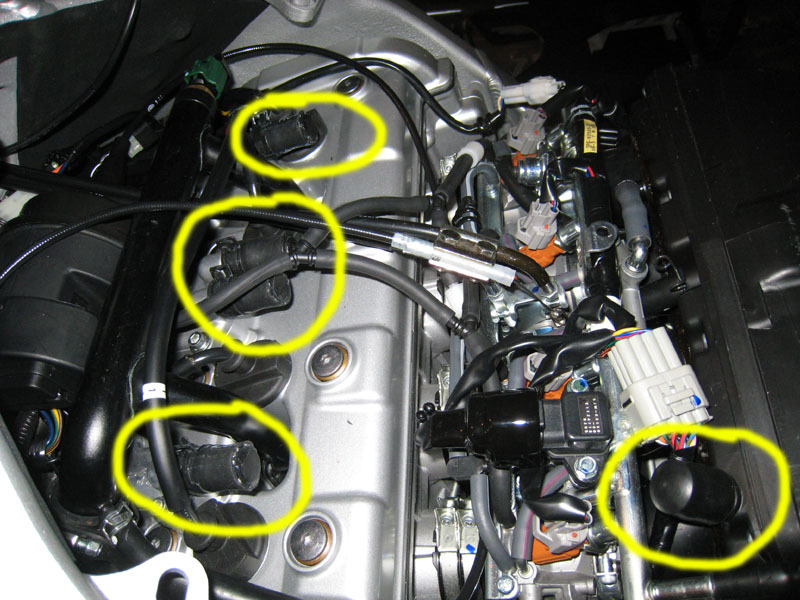 Some people on the forum have reported that airbox modifications do upset the throttle body synchronization, but re-syncing them after the mod would restore balance. The goal of these adjustments (CO settings and synchronization) is to get the same amounts of air and fuel in all cylinders regardless of inherent imbalances due to design and manufacturing tolerances. It would not make sense that the engine would be tuned to use different amounts of air in fuel in different cylinders, because that would reduce smoothness in both physical vibration and power delivery. As for why you would want individual fuel mappings per cylinder, I think that is to make up for slight differences in compression and cylinder size due to manufacturing tolerances, differences in the scavenging effect of the exhaust on each cylinder, etc., but I haven't really looked into it so I could be completely wrong. Bilge pump. A novel idea. Traveling to the beat of a different drummer. Maybe the Mottty AFR is not for me. I'm actually planning on eventuality installing a pair of two brother's and would like to dyno tune the bike to its maximum potential without losing reliability. I'm not really interested in tinkering so much. 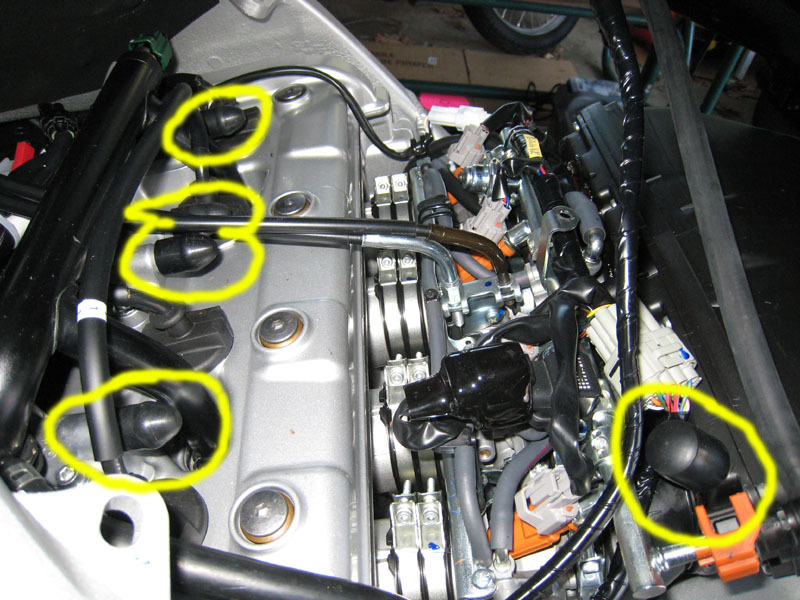 I am simply looking for the ability to adjust for maximum HP and Torque while using an O2 sensor. My understanding is most other tuners on the market require you to disconnect the O2 sensor. Please correct me if I am wrong, with a closed loop system if you set fuel air mixture, throttle, position etc on a dyno for maximum HP- that threshold for maximum HP setting will stay constant even if there is change in elevation, barometric pressure, temperature and so on. By disconnecting the O2 sensor you are relying solely on a map that will almost never be ideal for real conditions. I would not even know were to start without the aid of a dyno and a professional tuner. I'm certainly not an expert in this area maybe you can suggest another product to fit my situation?? If you think the Motty AFR is a good fit, then I look forward to your findings. 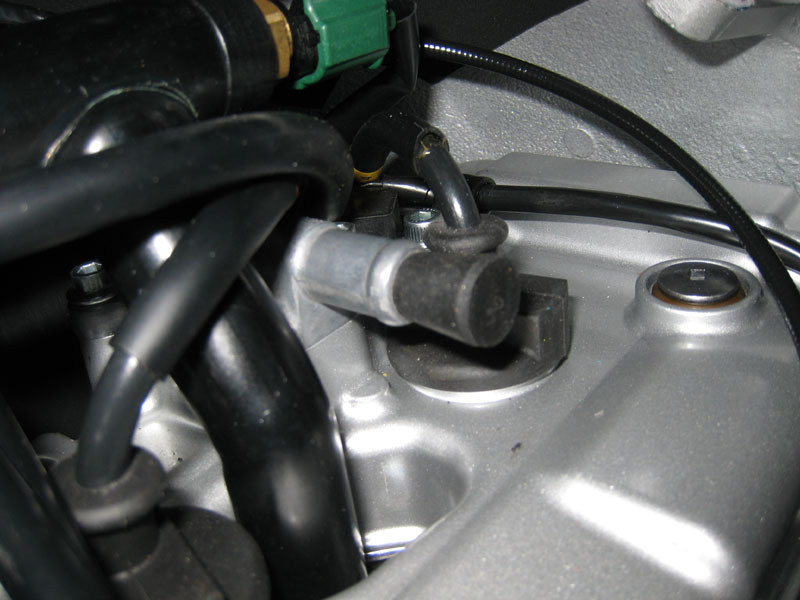 Yes, the stock O2 sensor must always be disconnected when attempting to override stock fueling. That's because the stock system uses the O2 sensor to achieve 14.7:1 AFR under certain conditions (a good AFR for fuel economy and low emissions). The stock sensor is a narrow-band sensor that can only detect if the AFR is about exactly 14.7:1, or if it is some indeterminable amount lower or higher. If you leave it plugged in, then in some conditions the stock system would fight against the altered fueling. The fuel injection system (EFI) does make adjustments to account for elevation, intake pressure, etc. However, the adjustments that the EFI makes are made under the assumption that the stock EFI system is working alone and not altered. It has no way of verifying that its adjustments achieved the desired results. Similarly, the Power Commander just always makes the same adjustments. The combination of the stock adjustments for atmospheric conditions with the Power Commander adjustments will put you further away from the results of dyno tuning as the atmospheric conditions become less like those that existed in the dyno room. I've heard of some people getting their Power Commanders dyno tuned twice to try to make up for this - once in the summer and once in the fall/spring for cooler weather. If you want closed-loop automatic self-tuning, your choices are the Motty and the new Power Commander V with the auto-tune module. Neither choice is magic. They are still tools that should ideally be adjusted to perform whatever job you want done (e.g., setting up the AFR map). Since the Power Commander is model specific, it will likely come pre-configured with decent default settings for your bike. I'll be working on good default settings on the Motty for an FJR. Looks like the decision will be driven mainly by price, features and ease of installation. You have to be willing to strip some wires and solder if you get the Motty (or pay someone to do it for you). Thanks for the write-up! 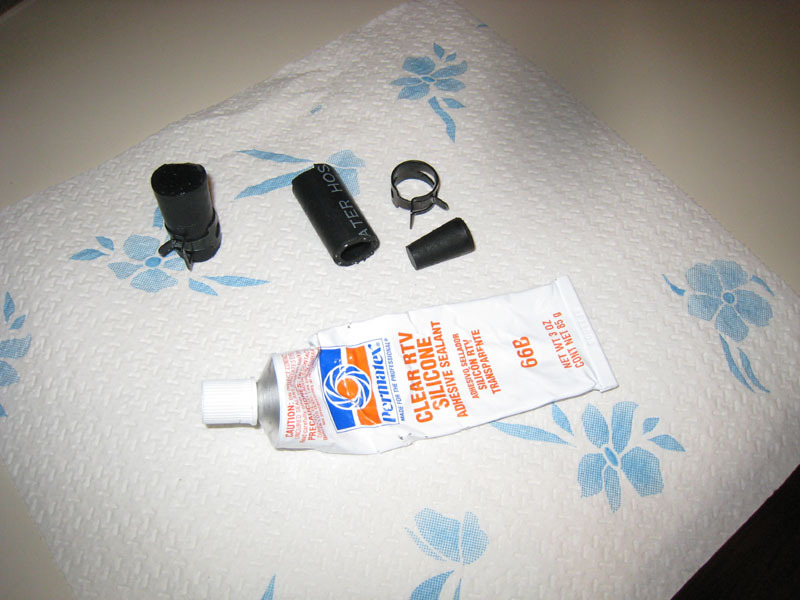 I have a similar product on my Harley (Zipper's Thundermax ECM) that is pretty much the same thing. It was about that same price, too (although it came with the O2 Sensors, and the late model harley's already have O2 sensor bungs in the exhaust headers, so that was a plus). I've been VERY happy with it, so I'm sure the Motty will do wonders for your FJR. I bought a PowerCommander for my FJR, which I'm sure I'll be happy with...but I'll definitely be keeping an eye on your feedback, so keep us posted! From the product description of the Thundermax, it sounds like it works off of a static base map (like a Power Commander), but performs on-the-fly adjustments based on O2 sensor readings. When I talked to a dyno tuner about the Motty, he advised against it because he had bad experiences with "self-tuning systems just like it for Harleys". His examples seemed to indicate that it never remembered what it had learned; every time you ride, it takes a while for it to learn again. This observation seems to make sense if the unit always starts from a static base map that is selected by the user (especially if the user didn't actually select a base map that is a close match to their bike, as it would require extensive "learning" every time). The Motty does not require the selection of a base map injection because it's continuously creating its own base map from the current conditions. Every time the Motty makes an adjustment based on the O2 sensor reading, the new adjusted value is saved to the "base map", so that next time that part of the map is used again, it will require less adjustment. This process repeats until no adjustment is needed at all. The next day when you ride the bike again, it will immediately be running on the results of your previous ride, which are likely to require very little (if any) adjustment unless you live in Michigan and the temperature changed by 50 degrees overnight. You always have the option of saving the resulting injection maps off the Motty for varying conditions so you can easily revert to an injection map that is close to the current conditions and will require less adjustment as you ride. If by "same price", you mean "$250 more"! The Thundermax EFI system + auto-tune module combo is listed at $899 here. I paid about $600 for the Motty plus $50 for a wide-band O2 sensor. You can get the Thundermax for about $650. The biggest difference is the TMAX completely replaces the ECM in the Harley. I ran one for almost a year. The biggest problem with it is it doesn't retard the ignition so pre-ignition (pinging) occurs. I ended up going back to the stock ECM and a Screaming Eagle RAce Tuner (SERT) and found the performance to be comparable, plus the peace of mind of no pinging. The Motty is cool because it is a piggy back design and does not eliminate the stock ECM. I like it and will be watching this thread.